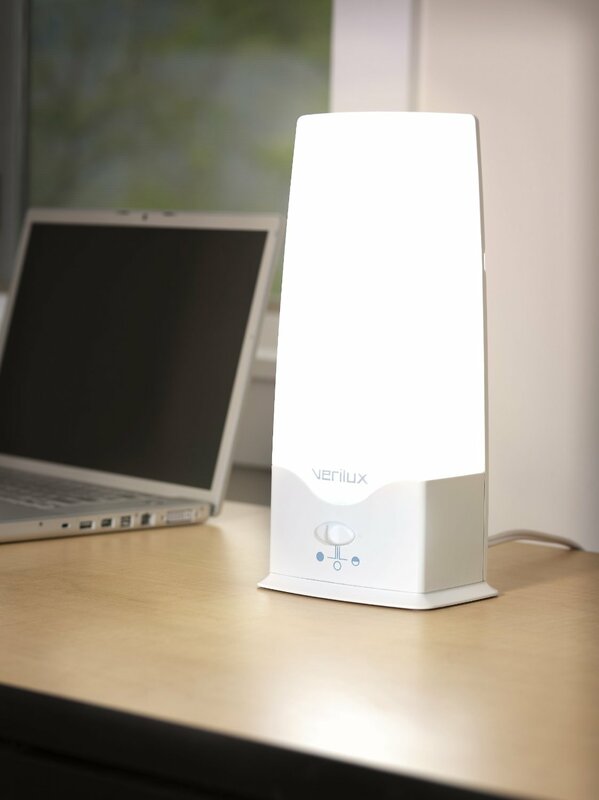 The Verilux HappyLight Energy Lamp 5000 model is a mid-range lightbox aimed at alleviating light occurrences of SAD. This lamp provides you with a reasonable 5000 lux, which is enough to brighten any day, giving you that much needed boost when you need it the most. As it is of a lower intensity than many other lightboxes out there, it will need to be on for at least an hour for you to reap the maximum benefit. Just like with any light box, the HappyLight 5000 is not intended to be used as a one stop solution to your ailments and the best results will come when you combine light therapy with a healthy diet and exercise regime. It has become a popular choice with new students who find that they have moved to a place where winters are a little gloomier than they are used to. As its name suggests, the HappyLight 5000 generates 5,000 lux of light, which is very respectable once you factor in its price and size. With compact dimensions of 6 x 4 x 12 inches, it is easy to find a nice home for the lamp. The whole thing weighs just 2 pounds, so moving it about is very simple. The base is well crafted, holding the light firmly in place so you can set it at the perfect angle. HappyLight makes use of the latest in Flicker Elimination and Electronic Ballast Technology, which means that the light turns on at full brightness, requiring no time to warm up, and guarantees a flicker and buzz free experience. The company also boasts about their patented lightbulbs, which have been carefully calibrated to be of minimal nuisance to the human eye. The bulbs, they say, give off light across the full spectrum of light, in order to replicate the light given off by the sun. The design is nicely finished with a soft blue tint to the silver plastic casing and the lamp avoids being ostentatious with a simple style that will not look out of place anywhere. It is definitely one of the more sleek light boxes that we have seen. Everything has been clearly thought out, with a power lead that runs securely into the back of the device to avoid clutter. The slot that the cable sits in carefully nests the lead so that you do not have to worry about the wires fraying or being exposed as you move the lamp around. This lamp is perfect for people whose symptoms could be described as mild to moderate. As the HappyLight only produces 5000 lux, it doesn’t deliver the recommend dosage for more severe cases of SAD (10,000 lux) but should make long lasting improvements to the lives of many users. Being less bright than other light boxes gives it the advantage of being able to function as a desk lamp, as you should find that you are able to leave it on for long periods of time. Turning it on and off is easily done and there are a few settings to make use of, allowing you to set the light at the brightness you feel is necessary. Not only is it a cheap option to start with, but the HappyLight 5000 should not cost you a great deal in the long run. It has energy efficient bulbs, requiring only 36 watts, which are quite cheap to replace, if you do find that they fail. Many users report the bulb functioning after well up to a year of regular usage, and while we have not been able to try it for that long, we encountered no issues. The lamp switches on without a fuss and there is no annoying humming or flickering even after prolonged usage. The light itself glows white, which can be a little harsh and even a little disorienting when moving in and out of range. The low cost of this item makes it ideal for anyone unsure about the possible benefits of light therapy. It is strong enough for you to start noticing if light therapy would work for you, whilst remaining weak enough to allow you to have it on for a lengthy period of time and get used to using a light box.